How in the world do you find buyers, investors and sellers? It’s a universal question that all entrepreneurs face… especially real estate entrepreneurs. When you’re new to doing deals, you tend to focus on finding properties first. But that would be a misstep. Building your lists of leads (a.k.a., buyers and investors) is the smarter way to go. That way, when you find properties, you actually have someone to flip them to or people who are interested in letting you use their cash and credit so you can buy and hold them as cashflowing rental properties. Lists are rarely scrubbed. The contact information can be grossly inaccurate. Lists are costly and overwhelming to get through. Besides, think about it… you buy a list and the real estate entrepreneur down the road buys the same list and another guy in your area buys that same list. Now what? You’re all hitting those people on the list? How’s that going to work for you? Maybe you’ve heard Yellow Letters work great. (By the way, they could be pink, gold, green or any other color letter.) Here’s a newsflash: Yellow Letters do not work very well. While attending these networking events can be a good thing to do, if you think you’re going to leave with bunches of new leads you are mistaken. More likely what will happen is that you spend three hours of your time – maybe more if you have a long drive there and back – to attend an event, listen to speakers and have short breaks to actually network with the other people in the room who are all there doing the same thing you are. You will be lucky to walk away with three business cards that you will take home with you and toss into the corner of your desk. Was attending that event worth it? Um, no. You need a better way to generate leads… like 30, 40, 50 or more every day. You want to have leads come to you 24/7 without end. You’d really like to generate leads without leaving your home or office (especially if you’re still working a day job). You need to create leverage that will keep generating leads online and off! How can I speak so frankly about this? Because just like you I was once new and didn’t have a clue as to how to generate leads. However, I couldn’t turn a blind eye to the problem. I had no choice but to learn how to generate leads in the real world. And I couldn’t stop there. Part of the way this system works is by creating leverage in your life by building yourself as a local expert and then putting that system on steroids. And let’s face it, as a real estate entrepreneur the more leverage you have the better. Simply stated, “leverage” is achieving more with less. The problem is that as a new real estate entrepreneur, you don’t have leverage yet. People don’t know you, they don’t know what you do, they aren’t interested in helping you or working with you because they don’t yet trust you. That’s because you’ve done nothing to promote your knowledge or set yourself up as the local expert… the go-to person for those who would want to participate with you in real estate transactions (if only they knew you existed). You need a way to get people to trust you. If you don’t know how to do this you’re stuck attending real-world networking event after real-world networking event… which gets old fast. It’s a complicated issue only if you let it be. You have other options. You just don’t know what they are yet. Hey, you don’t know what you don’t know, right? You Need a More Reliable Method. You may not know how to generate leads of buyers, investors and sellers, but you know for a fact that you need them. These leads lists are missing ingredients that are keeping you from your goals and the level of success you dearly desire and you dearly deserve. How am I going to retire and live comfortably? How am I going to pay for my kids’ college without breaking the bank (or robbing one)? How am I going to get my family a comfortable life where money is not a worry? How can I take truly memorable vacations with my family and friends where we can stay for more than the measly week or two off that I get at my work? How can I leave my job so I can experience the freedom that I see other people enjoying? How can I live in one of those beautiful, big houses I see in my city, what do those people do anyway and why can’t I be like them? You know those people you see with the nice houses and really long, cool vacations who can afford to put their kids in top colleges? Most of them have something in common. It’s a sure bet that they invest in real estate and they learned a few secrets to generating leads while they sleep… and that goes for literally any business they happen to own and/or operate. You Can’t Chase Leads… Get Them to Come to You Instead! Earlier in this article you learned that using Yellow Letters or any other mailer for that matter doesn’t work to generate the numbers of leads you need to create the success you desire. That’s because people get too much mail as it is. So what is it that you need to be doing instead and in which order? Then what… or rather what should you be doing WHILE you are doing all these things? In some cases you are already doing some of what you need to be doing online, so it’s a matter of adjusting your approach and tweaking just a few things. The cool part is that you don’t even need a website, your own content, a huge marketing budget, any understanding of the technologies involved in online marketing or even a whole lot of time to get fish (otherwise known as leads) jump into your boat! Never before in the history of the world have we had so much access to information at our fingertips… literally. There is nothing you can’t find online with the right search words. Unfortunately, this gives rise to scammers and spammers… those in the world who would be more than happy to sell you lists and teach you how to mail out ineffective Yellow Letters. You may feel inclined to buy into that silliness because you are desperate for leads and you want an easy path. But it just won’t work. There isn’t really an “easy” path to wealth and success anyway. You have to put in the time required. The good news is that generating leads doesn’t have to be hard. Not when you have the right tools and tactics. Not when you know how to use social media and the rules of engagement that ATTRACT leads to you vs. you chasing after them. Let’s say you’re in a parking lot at a furniture sale… you know, the outdoor tent sales you see on the side of the road sometimes. You’re walking around looking at stuff you want for your home. Suddenly a salesman approaches and asks if he can help you with anything. You tell him you’re just looking, because you are… you want time by yourself to look at what all’s under the tent. Two seconds later the sales guy is back. He starts hammering at you about the benefits of the couch you’re standing in front of and you don’t even want a couch. You’re not there for the couch and now you feel like running. So you politely back away and make a bee line to your car. Next thing you know the salesperson is chasing after you, yelling at you that you can’t go… you need to buy his furniture. He needs the sales. That’s how you’re making people feel when you come out of left field trying to sell them something when they don’t know you. You haven’t built their trust in you or your goals. You aren’t targeting the right individuals. You don’t know anything about them in the first place, so how can you know if they share your goals, mission and vision? This is especially true as a real estate entrepreneur. If you don’t want to be like the salesman chasing you down in the parking lot, you need to learn one important fact. Building relationships and letting people get to know you and what you have to offer vs. trying to sell them something is the only way you’ll reach success as a real estate entrepreneur. Building solid relationships takes time. It takes doing the right things and not irritating people by chasing them. You want people to want to work with you vs. being repelled by your mailers and forceful outreaches. Fortunately, building those relationships through digital marketing speeds the process. If you knew that by this time next month you could have a database of buyers, investors and sellers… and we’re talking 30, 40 or maybe 50 a day… without a lot of time and effort, would you do what it takes to get there? If you could have the secrets of digital marketing that would make all the difference in your world and in the worlds of your loved ones, would you do what it takes to get there? 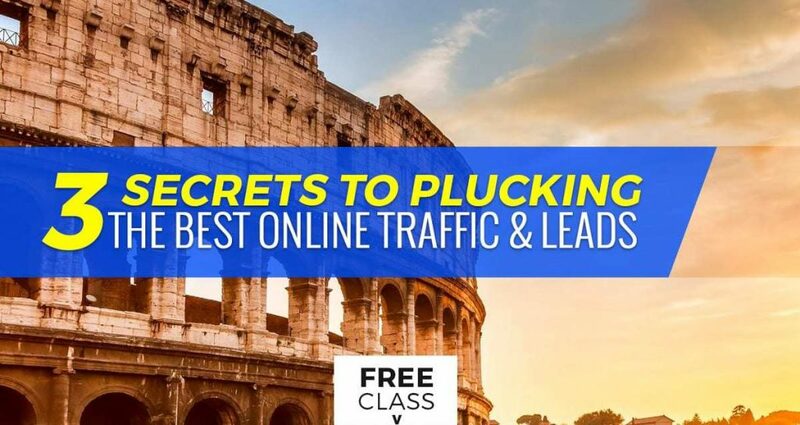 If there were a free class you could take that would teach you even ONE thing you could do as early as today to start generating leads, would you take it? BTW, sharing is caring. If you know anyone who might be interested in the information presented in this article or what you learn in the free web class, please share it.